Purchasing a quality product doesn't have to mean an empty wallet. Prices vary depending on type, brand, and the vendor. Buying balsamic vinegar is no different. Here's an easy guide to purchasing this versatile vinegar that originated in Italy 900 years ago. A good way to start is to figure out how the balsamic vinegar is going to be used. Aging and the wooden casks in which it's stored play a part in creating the flavor and texture of balsamic vinegar. Young vinegar (da insalata), which is aged up to 5 years, is usually used for dressings, dipping sauces, and marinades. 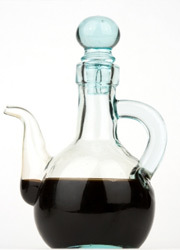 For use in sauces, pastas, or braises, a medium-bodied middle-aged (medio-corpo) balsamic vinegar works well. 12 year old vinegar is best used in the cooking phase and on vegetables and fresh fruit. As finishing touches for hot dishes, meat, and mild cheeses, very old vinegar (extra-vecchio or il patriarca) aged 25 to over 100 years is recommended. Mind you, these are merely suggestions for culinary ideas and inspiration. Decide which grade you want: traditional, condiment, or commercial balsamic vinegar. Traditional balsamic vinegar (balsamico tradizionale) is aged a minimum of 12 years, while commercial and condiment grades may not have been aged at all. Whereas the traditional vinegar cannot contain any wine vinegar, condiment and commercial grades can. Condiment grade may be made using the traditional methods and outside of the two originating provinces, but it is not required to meet any official standards. Commercial grade (aceto balsamico) is an imitation of the real deal and is easily mass produced. Both of the latter may also contain added coloring, flavoring, and thickeners. One may also further the imitation by simmering the vinegar in a pot with a bit of sugar and allowing it to reduce and thicken. This is where ratings and standards come into play. Certified traditional balsamic vinegar is produced only by Modena and Reggio Emilia and under strict guidelines of the consortia. Quality and authenticity are guaranteed. Modena designates age with a cream cap for one at least 12 years and a gold cap for one aged at least 25 years. The latter will also have "extra-vecchio" on its label. Modena's bottles are squat and round while Reggio Emilia's have a long thin neck and a round label with colored seals designating vintage. A red seal is the minimum 12 years, silver for at least 18 years, and gold for 25 years or more. Authentic balsamic vinegar is identifiable by the Aceto Balsamico Tradizionale di Modena or di Reggio Emilia on its label. Condiment grade balsamic vinegars are usually designated with "condimento balsamico", "salsa balsamica", or "di mosto cotto" on their labels, but they lack any official standards so one could be over-paying for the level of quality. 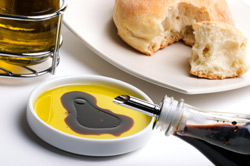 Some balsamic vinegar is certified through a four-leaf ranking system by the Italian Association of Tasters for Balsamic Vinegar of Modena, whose goal is to inform the consumer about what they're purchasing. If possible, do some taste-testing of different balsamic vinegars; often specialty stores will have samples available. High quality balsamic vinegar should be sweet, complex, and have a woody aftertaste. Its texture should be thick and syrupy and its color a rich dark brown. Like wine, balsamic vinegars vary in aroma and flavor. The lesser the quality, the more apt a balsamic vinegar is to be runny, unbalanced in flavor, and taste more like the wine vinegar it may have been made with. Last, but not least, comes the question of cost. How much do you want to spend? Keep in mind that a little bit of balsamic vinegar goes a long way and provided it's kept away from heat, a small bottle can last a long time. Certified traditional balsamic vinegar will cost more than the uncertified or non-traditional lines. A 3 ounce bottle of Aceto Balsamico Tradizionale di Modena costs about $150 and some consortium-sealed bottles may cost up to $400. $25 bottles of aged balsamic vinegar are out there, it's just a matter of shopping around and finding them. Being able to purchase online from stores such as Williams-Sonoma, Dean & DeLuca, and World Harvest is also handy. One doesn't need to empty their wallet to bring a taste of Italy to the table.